Art has been an interest of mine since I was very young. I remember being 6 or 7 and knowing the different styles of art, and having little greeting cards with different Picasso works on them. I was such a normal child. Impressionism has always been my favorite style. Something about the brush strokes and how romantic they are. I love how a simple pond can take on thousands of colors in the sunlight. I could look at artwork for hours. For a hot minute I even thought about studying art history in college. 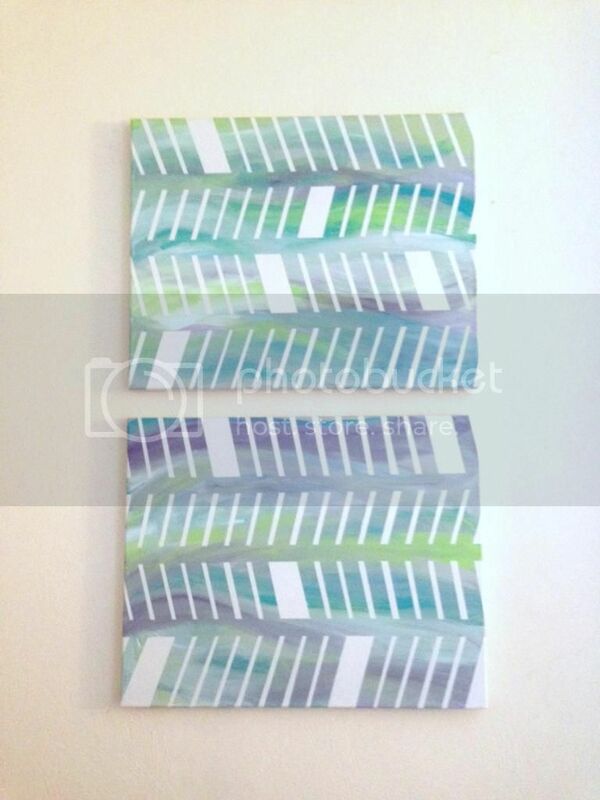 I love to incorporate prints into our home decor, but I also like to try my (very unskilled) hand at taking influences and bringing them into my own art work. We had a bare wall in our bedroom that was begging for some attention, so I thought I could try to blend my love of impressionism with something trendy. I started this project by painting two canvases (the canvases were the only things that I bought for this whole project). 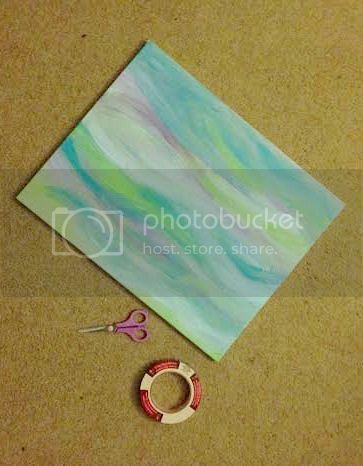 For the colors, I wanted something that would go with the colors of our bedroom (duh) so my inspiration was Monet's Water Lillies. This was my inspiration for this project in terms of taping. I've had this image pinned to my "Apartment" board for a couple of years now. I started out taping one pattern (like the brick pattern in the pin) but quickly got frustrated because I couldn't get it even AT ALL. I may have a little bit of OCD. 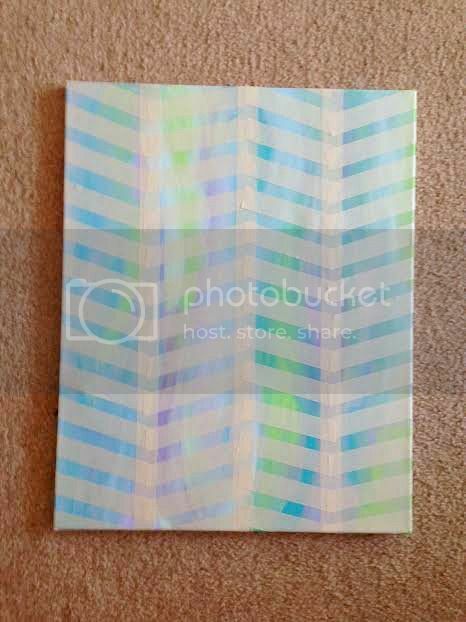 To tape a herringbone pattern, I started with the vertical lines, dividing the canvas into 4 sections. I then eyeballed diagonal lines making the herringbone. I decided to leave some random pieces out, to create a little bit more visual interest. Once everything was taped, I gave everything a few good coats of white spray paint before peeling off the tape. I decided to hang these horizontally on the wall, since I think they look better that way. These go so well with our bedroom color scheme. They were an easy and cheap way to bring some color and visual interest to the walls, which are a weird, fleshy beige color that you always get in a rental. They were very easy to make, and pretty stress relieving too. Most of the steps were done while I listened to The Goldfinch on audiobook. While you are here, take a second and follow my new Lavender's Blue Blog Facebook or Bloglovin page! You'll get all posts and updates as they happen! Looks great! I would love it if you joined and contribute your awesome posts at my link party at City of Creative Dreams, starts on Fridays :D Hope to see you there at City of Creative Dreams Link Party. Love this! 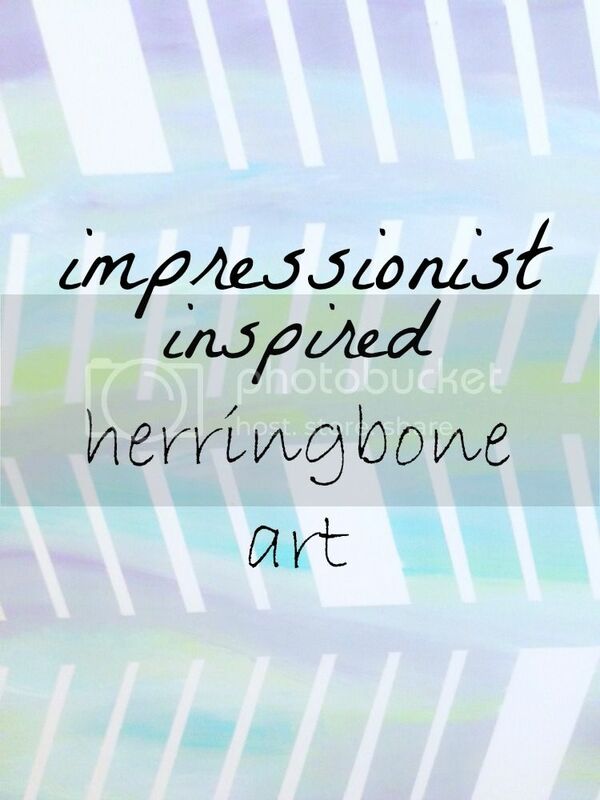 I love herringbone and that you used Monet as inspiration :) Great job! I LOVE this Alex! The effect behind the herringbone is SO lovely! Thanks so much for sharing at Linkn' Blogs this week! Love the soft color. 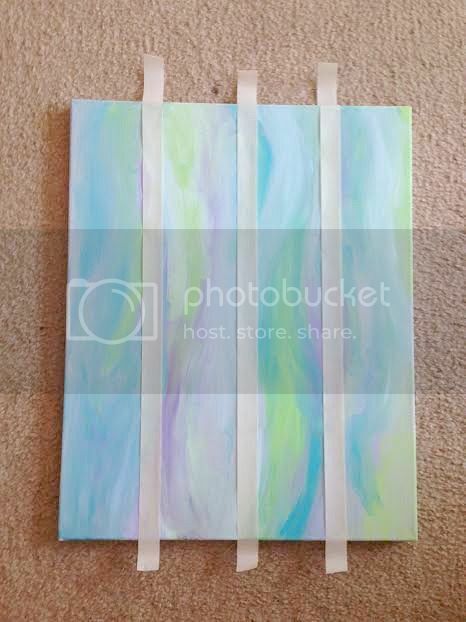 What an easy way to create my own unique art. I may be trying this for our bedroom! Thanks! 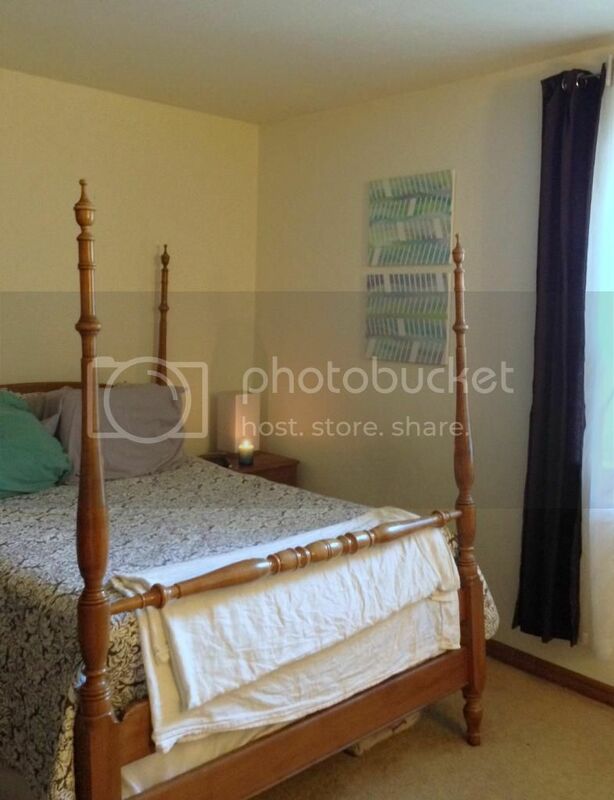 You could probably do it with any color scheme and any pattern. If you do it, I'd love to see it! This is so pretty and creative! Thanks for linking up to Something Fabulous Wednesday! Wow, great job, those look really good! Thank you :) They add a nice touch to that blank wall. You've been featured at Link'n Blogs! Stop by to see your feature and link up more fab projects. Thank you! It ended up being the perfect addition to our bedroom décor.